There is a scene somewhere in the middle of this film that captures the essence of disability. The central character is immobilized on a bench while a fly perches on his nose. He cannot swat it nor can he tell anyone else to bat it away. Finally, it flies away and there is a sense of relief. The insect is a little irritant, yet it looms large in the face of an absolute inability to rid oneself of it. When I turned 60, I began to realize that I, too, could not always rid myself of bodily pain or discomfort. It takes time and mental effort to come to terms with a changing body. I experienced little aches and pains, my daily run became more challenging, and I knew that I could no longer be casual about my health. A sense of mortality became present in my life. This sense of mortality can paralyze someone or spur him on to making every day count, by savoring the moment and appreciating the beauty of everyday miracles. The roadmap is unclear. It is not a comfortable realization to know that one is disabled physically, to know that one is no longer in control of his body. This difficult and painful epiphany is at the heart of The Diving Bell and the Butterfly. The film’s opening titles are placed against a backdrop of medical x-rays, foreshadowing the serious medical condition of Jean-Dominique Bauby, the former editor of Elle magazine in France. The movie begins with him waking up from a coma after having suffered a stroke. We see things from his perspective. Everything is in and then out of focus. He sees doctors and nurses and tries to talk to them. We hear what is going on in his mind and we share his frustration and disappointment when he realizes that no one hears him. The doctor informs him that he has a rare condition called “locked-in syndrome,” which prevents him from moving anything other than one of his eyes. This ability to blink becomes Jean-Dominique’s way to communicate with the outside world, and the doctor is optimistic about making progress. But, in spite of the doctor’s upbeat assessment, this is depressing news to Jean-Do, as he is affectionately called by his friends. His friend, who has suffered four years of incarceration, in a brief visit tells him: “Hold fast to the human inside you. You’ll survive. That’s what I came to tell you.” This conversation stays with him and Jean-Do begins to understand that, in spite of his paralysis, he can still live in his imagination and in his memory, two parts of his life that are free and unrestricted by physical disability. The Diving Bell and the Butterfly is an unusual and powerful film. On the surface, it is about a person who suffers a stroke, which leaves him unable to speak or to move his body. In a more universal sense, the film is about the plight of the disabled as seen from the point of view of the disabled person. The first half-hour graphically depicts his realization of his paralyzed state and his initial efforts to communicate to those around him. All of us have seen handicapped people, but the inner struggle that goes on inside the mind of the handicapped is largely unknown to us. We can sympathize, but we cannot really understand the overwhelming emotional darkness and isolation of one who lives daily with physical challenges. Now, through this film, we get a glimmer of understanding about life lived with physical limitations. Furthermore, it reminds us of the blessings Jews say every morning n which they thank God for the fact that each part of the body is working. We thank God that we can see, that we can walk, that we can go to the bathroom and relieve ourselves. No aspect of our physical life is to be taken for granted. In this sense, the movie is an instructive teaching tool. It compels the viewer, through its vivid and naturalistic imagery, to be thankful each day for being ambulatory, for possessing the ability to speak and to communicate freely with others. When a dear friend of mine would be asked how he was doing, he always responded, “Thank God, fantastic.” He did this because he truly felt thankful for the everyday miracles with which he was blessed. 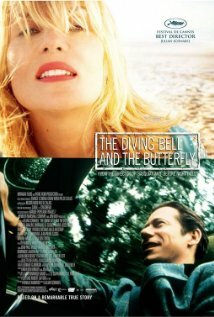 Watching The Diving Bell and the Butterfly will make you appreciate life more. Do the math and count your blessings.